:: Books click any image with a coloured border to enlarge. In all there are three books detailing Joy's work. In addition a book entitled 'Tributes from her friends' was produced following her death in 1991. This, if nothing else, demonstrates the affection and regard that people held for her. 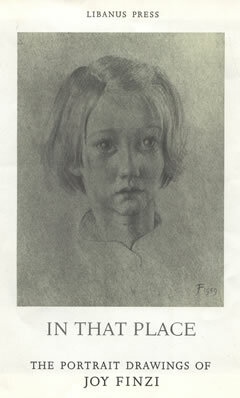 In That Place (1987), a collection of fifty-two portrait drawings. Tributes from her friends (1991), various recollections. Published by Libanus Press and featuring a collection of 52 drawings. While the binding might not initially look spectacular, it is a superb piece of work that befits such a book. It is adorned on the front and rear with a repetitive pattern featuring the 'F' logo that Joy commonly used to sign her work, with an offset shadow. The spine is then leather bound with gold-block lettering and the entire book is presented in a rigid slipcase covered with a plain brown material. The original leaflet has been used for the purpose of illustration. 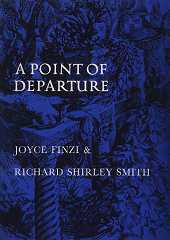 A collaboration between Joy and Richard Shirley Smith, producing a collection of 30 poems with exquisite illustrations. Featuring various recollections of her friends and family. 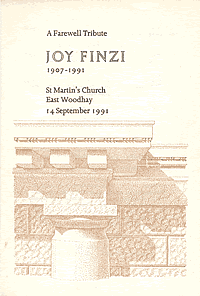 In addition, the final book published that related to Joy was Tributes from her friends. Self-explanatory, this was published after her death and contains various fond and poignant memories from her friends and family. The cover (right) is not from this book, but the Memorial Service. Joy was always prepared to encourage new talent and collaborated with two engravers to illustrate her poetry books. Click the links below for books detailing their work (Amazon).